Living in Louisiana, I have seen people going absolutely crazy about anything Saints oriented. After the game last week, there were many who went to the local sports store (after 11 p.m.) to get their championship t-shirts. CRAZY!!! Mine can wait. As many of you know, the New Orleans Saints have not been very good for many years. They have been referred to as the "Aints" and many so called fans have gone to the games wearing bags on their heads. Now that they have had a winning season, and are headed to the Superbowl, many are taking off their bags and stocking up on anything Saints. I have a friend that is getting ready to move from here to Utah. For a going away gift, I decided to make her a necklace. 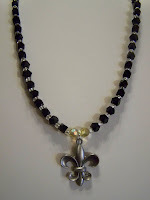 I knew I wanted to put a fleur-de-lis pendant on the necklace and thought it would not be difficult to find one here in Louisiana. Well, when I went into the craft store, I was greeted with black and gold ribbons and bows, Mardi gras beeds, etc. in the entrance of the store. As I looked for my pendant, I could not find what I was looking for, so I asked one of the employees and she showed me the one and only in the store...they were almost sold out! 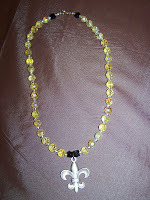 So, I grabbed some black and gold beads and headed home to put together these necklaces. Even though I am not a Saints fan, I thought these came out pretty nicely. I've just got to figure out which one to give my friend. In a couple of weeks we will all be sitting down watching the Superbowl. My husband has been a Colts fan since he was a little boy. He loved watching Johnny Unitas and Mike Curtis. When we lived in Indiana, about an hour northeast of Indianapolis (in Muncie), our kids became Colts fans. I never really got into it that much. I like teams like the Miami Dolphins or the Denver Broncos. Anyway...we will all be rooting for the Indianapolis Colts. I think we may be a little out numbered here in the neighborhood, but that's ok, especially when the Colts win...lol. But even if the Saints win, then that's o.k. They have never had a better season than this one, and for so long, they have struggled. Soooo....may the best team win! It's been awhile since I've been on my blog. A lot has been going on. As I mentioned before, we had a great Christmas. Soon after all the holidays, though, we had a blast of very cold weather. Something we don't get much of here in Louisiana. We even had a little bit of snow. No, it did not stick, but it did come down to where we had a beautiful show. It was just that the ground was too warm for it to stick. When we lived in Indiana, our dog, Sox, use to love the snow. She hadn't seen the white stuff for quite a while, so when I opened the door to show her (thinking she would be excited) she ran the other way. Yes, she was scared of it. It was pretty funny. Well, after our cold spell, we all started getting sick. First it was my 16 year old son. He started the coughing, sneezing and watery eyes stuff. Then it was my husband. He actually got it pretty bad. At first he was ok, just a little cold, then it hit him like a rock. He missed two days of work (it would have been three if it had not run into the weekend). Then two days after he was well enough to head to work, I got it, and boy did I ever get it. I was in bed for THREE DAYS!!! I hated every minute of it, but I just could not move. The fourth day, no matter what I was determined to get OUT OF THAT BED! Which I did, but did not accomplish much at all. It has been over a week ago that our family was struck with this crud, and my son and I are still having coughing attacks. I remember last year, once I got the cough, I had it for more than 6 months. I do this every year. Hopefully this will go away soon. Our youngest boy has not gotten sick yet. We are hoping that he stays well. The weather has warmed a bit. Today it actually got into the 60's and this past weekend it was 70. We are suppose to be getting another round of cold weather, and they are calling for more snow. No, I'm sure it won't stick then either, it will just be a little teaser if it snows at all. I hope that the weather holds for a little while. You see, I have not been able to walk since before Christmas. Between our company, rain, temperatures in the teens, and then being sick, it has been over six weeks since I've walked. So....tomorrow, I am planning on walking! I am really looking forward to it, and hope that I do not have a coughing attack!